Okay. I kind of couldn’t believe it when there, in my inbox yesterday, sat a message saying “Effesenden Music has been published on Junebug Weddings!” I’m forever marveling at the beauty and creativity of the weddings we are privileged to perform for but it’s something extra special when the national wedding community takes notice as was the case when Junebug Weddings did a spot on this gorgeous ceremony at Hoyt Arboretum in July. I loved this wedding because as a true Oregonian, all things outdoors and tree related are close to my heart… and then I have this alter ego as a professional classically trained violinist so when the two combine: playing beautiful acoustic music in a gorgeous Pacific Northwest Forest for people who obviously dig the outdoors… well, I’m a lucky lady. 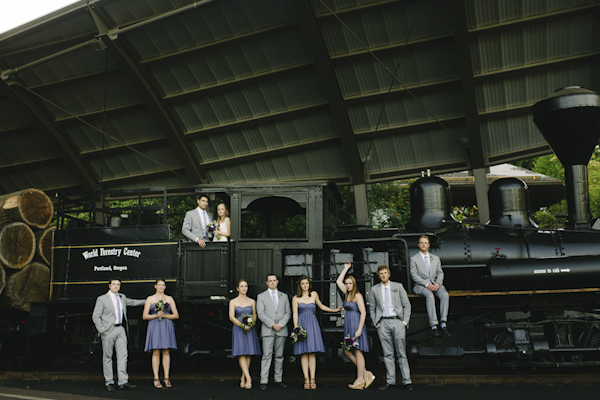 I have to add, that this photo that Aaron Courter took has got to be the most awesome bridal party shot ever taken. Love it! Our ensemble consisted of Violin, Cello and Acoustic Guitar. One cool thing is that we actually did not use any amplification and the sound still carried beautifully. I always want the sound to be its best but sometimes it’s unfortunate when one is playing in such an organic, natural setting to then have to add chords and cables of the sound system. For a wedding the size of this one… less than 100 guests, it was just perfect. I’ll be posting some of our recording from the day soon. . .so be sure and check the Listen page on our website if you want to explore the live recordings from our recent weddings. Effesenden String Quartet in Hawaii Featured in Martha Stewart Weddings! Effesenden string players travel all over the West Coast (and beyond!) to perform for weddings, concerts and events. Last summer our string quartet traveled to Hawaii to perform for a breathtaking wedding at the Haiku Mill on the island of Maui. We were thrilled to learn that the wedding is currently featured on Martha Stewart Weddings. The music we prepared was a fun mix of contemporary and classical music. We wrote six new arrangements of songs meaningful to Caitlin & Loren ranging from AC/DC to Bach along with selections from our current repertoire. Because we love to empower our brides and grooms to have music that is meaningful to them, we include special requests in every reservation. This means that we also have an ever expanding repertoire list~ future couples benefit from the musical selections of our previous clients. You can check out our complete current repertoire here. You might think that the idea of a string quartet traveling to perform for a wedding is a bit unusual but musicians travel all the time to perform, audition and attend festivals. Since so few other wedding ensembles focus on customized music the way we do, our music is in demand beyond the confines of our Pacific Northwest home. We’ll leave you today with a live recording from Caitlin & Loren’s wedding: I Wanna Rock and Roll All Night by KISS. This was performed during the couple’s chic cocktail hour. We were sheltered from the tropical rains that happened to show up that day by a HUGE mango tree. I was so busy arranging music this summer that I didn’t have a chance to upload a list of our current offerings. As you can see we have quite a few updates to our Rock, Pop, World Music, Movie Themes and Jazz Sections. The first section is our offerings for string trio and quartet (2 Violins & Cello or Violins, Viola & Cello). I did not list the classical repertoire of our string trio and quartet because we can basically perform any classical selection you are looking for. For a list of suggestions, please contact us directly. The second section is for our Acoustic Ensembles (Strings in combination with rhythm instrument~ either piano or guitar.) If you would like access to our entire repertoire, consider a combination ensemble such as string trio with guitar or string quartet with piano!